ClubCoins Нужно: 58 Please note that, for now, you cannot download content from our platform directly onto a mobile device (phone, iPod, iPad, tablets...). You need to download your items onto a PC or Mac, and then transfer them onto your device in the normal way. We are working on allowing direct downloads to mobile devices but this is not possible in the current version of the platform. Sorry about the inconvenience! 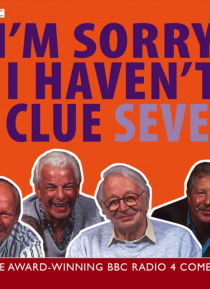 I'm Sorry I Haven't a Clue is the authentic antidote to panel games; a hardy perennial which continues to blossom with puns, one-liners and general hilarity year after year. In this seventh collection of episodes, the gang are back once again for four doses of mayhem and inspired ad-libs. Chairman Humphrey Lyttelton takes charge of proceedings as regulars Tim Brooke-Taylor, Barry Cryer and Graem… e Garden are joined by special guests Jeremy Hardy, Phill Jupitus, Andy Hamilton and Sandi Toksvig. Old favourites such as 'Mornington Crescent', 'Swanee Kazoo' and 'One Song to the Tune of Another' are this time joined by rounds including 'Italian Radio Times', 'Karaoke-Cokey', 'Sound Charades' and 'Musicians' Chat Up Lines'. Accept no substitutes!